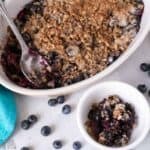 I’ve been looking for some easy no cook recipes to enjoy over the summer. Because who wants to cook when it’s hot? 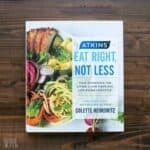 Low carb salads are always a staple for me in the warmer weather. Usually, I like to just top a baby lettuce spring mix with grilled meat. But sometimes I prefer a cold meaty salad to enjoy as a sandwich. 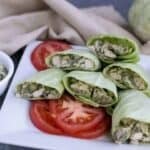 So today I’m sharing a easy pesto chicken salad wrap recipe. I do have a basic chicken salad that doesn’t have much pizzaz. Therefore, I created this recipe to take it up a notch by adding in some pesto. Making pesto sauce is incredibly easy to do. You just need a blender or food processor to whip it up quickly from fresh ingredients. Typically, pine nuts or walnuts are used to make pesto. However, I decided to use toasted pecans instead. I usually have a basil plant growing in the kitchen. But my last plant didn’t do well and I haven’t replaced it yet. In the past, I rarely used fresh herbs, only dried ones. Now, I prefer using them fresh when I can. It makes everything taste so much better! 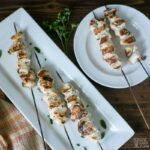 To make the sauce for this pesto chicken salad wrap recipe, I simply processed fresh basil leaves with garlic, oil, and toasted pecans. As you can see, it’s a cinch to make pesto and it really gives plain old chicken salad a much better taste. I’m not sure why I didn’t think of it before. Perhaps my taste buds have matured now. The fresh herb sauce is really a refreshing change from what I was making before. And it adds so much flavor to the chicken salad. Although you could use a low carb wrap, I chose to use cabbage leaves to make the sandwich rolls. 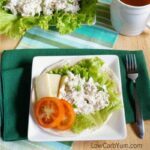 Other great options to use to hold the chicken salad are coconut wraps or lettuce leaves. Lettuce is a bit flimsy so I prefer using cabbage. Not only are the coconut wraps perfect for sandwiches, I enjoy eating them as a snack. I eat them like a fruit roll-up. 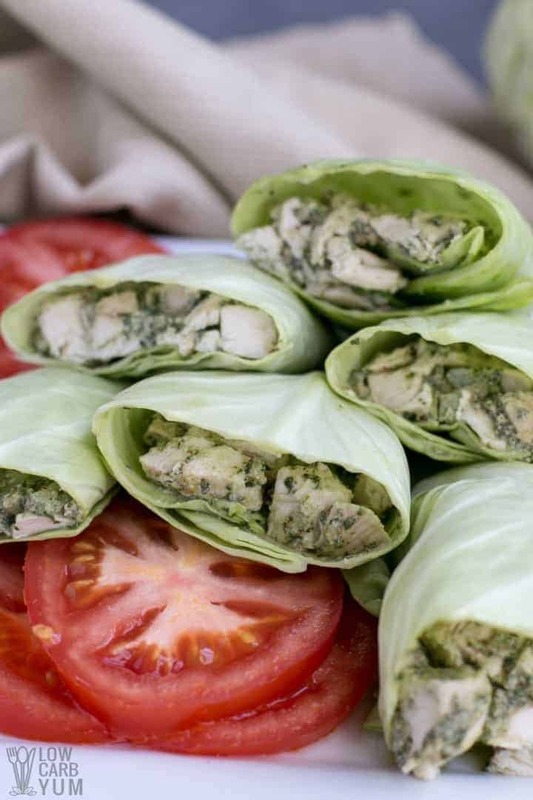 Of course, you don’t have to use the pesto chicken salad wrap recipe as a sandwich. 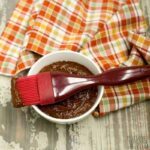 It’s perfect for eating right out of a container! Also, rather than wrapping it, I sometimes just pile the salad in a bowl or on top of a lettuce leaf and eat it with a fork or spoon. 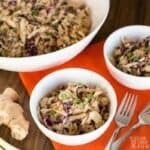 And using canned chicken, leftover chicken, or using the Instant Pot to pressure cook a whole chicken are my favorite ways to get cooked chicken for this salad recipe. 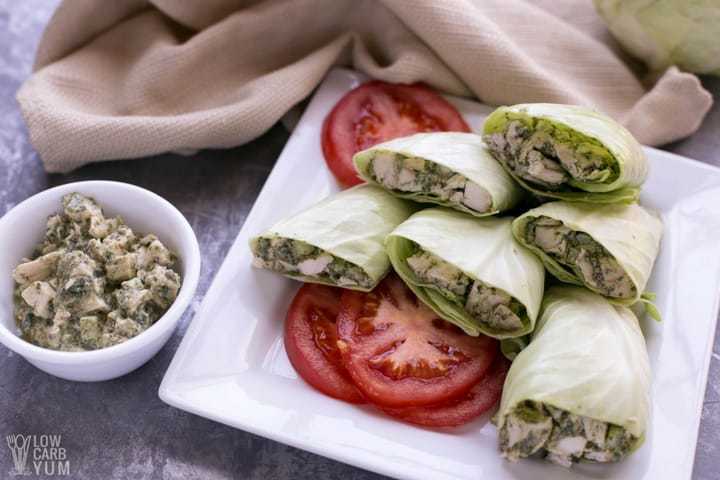 Making a double or triple batch of this chicken pesto salad wrap recipe is always a good idea. That way, you can share or enjoy it the whole week. 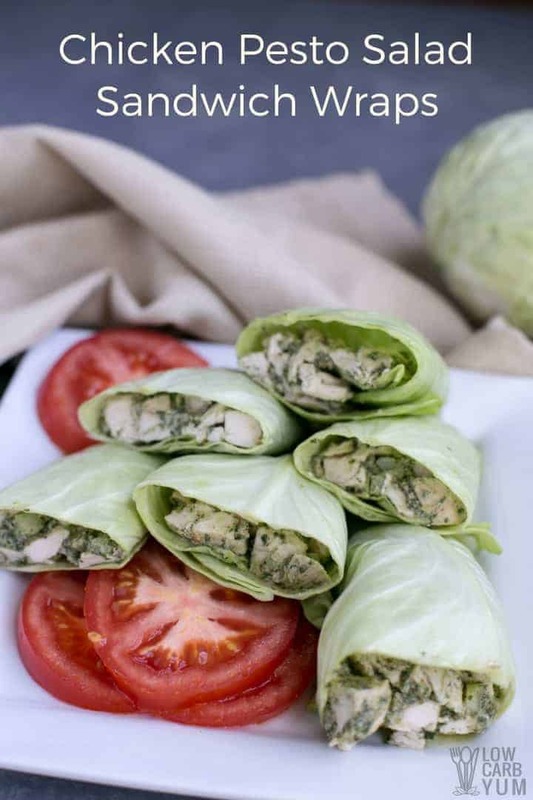 Just make sure you have some lettuce leaves, cabbage leaves, or low carb wraps on hand to make simple sandwich wraps. 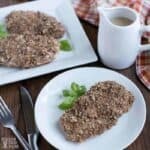 Kim over at Low Carb Maven has a recipe for almost zero carb wraps that are made with pork rinds and cheese. So the carb count in those homemade wraps are super low. However, I find most homemade tortillas and wraps are a bit eggy. Therefore, my low carb tortillas don’t use any eggs in the recipe. I’ve also cut back on eggs considerably since I discovered that I’ve developed an egg white sensitivity. One of the symptoms is fatigue and I tend to get tired after eating eggs. 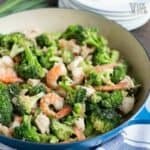 I think you’re going to love this tasty paleo chicken salad. It’s definitely got a lot more flavor than the traditional style. 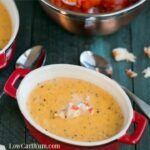 And, it makes a very filling lunch that you can pack for work or a road trip. If you give these easy sandwich wraps a try, let me know what you thought in the comment section below. A simple chicken salad that whips up in a jiffy. 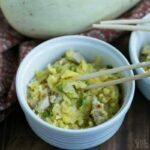 Using cabbage or lettuce leaves makes it low carb and paleo friendly. And it packs well in a lunch bag for work. 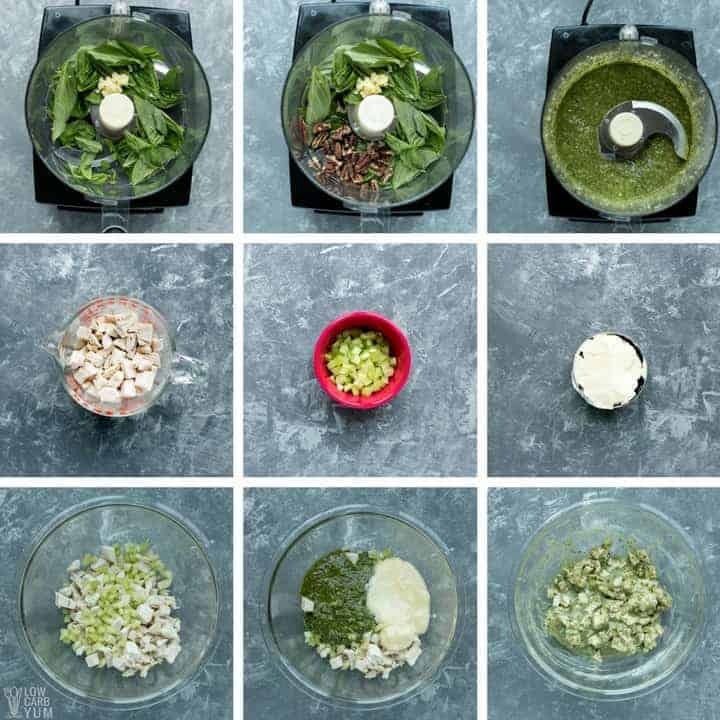 Prepare homemade pesto by combining all the basil pest ingredients in a food processor or blender until smooth. Add chicken, pesto, mayonnaise, celery, salt, and pepper to medium bowl and stir until well combined. To make a sandwich, place scoop of chicken salad on a lettuce or cabbage leaf and add any optional ingredients. Roll up and enjoy!